The Heart Templates have been designed to give you sharp points where you should have sharp points. The template has a Ruler Foot rest as a place to start and stop, making it easy to align the template for the next stitching path. 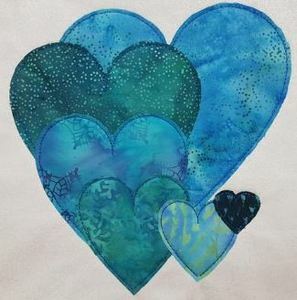 Now it is easy to stitch beautiful Hearts. This 6pc Template Set helps you create beautiful hearts. Sizes range from 1" - 6". 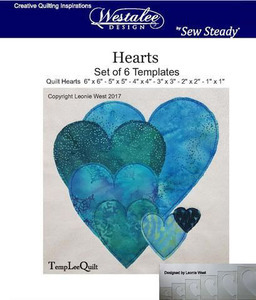 Stitching hearts is easy with this set of 6 templates. Ranging from 6” – 1” quilted designs. Great for TempLee Technique! A set of 6 Hearts that will melt your Heart. 1x1, 2x2, 3x3, 4x4, 5x5, 6x6" heart teamplates with ruler rest as a place to start and stop. I am impressed with the quality of my heart templates & will use them a lot.